iPerf3 is a tool for active measurements of the maximum achievable bandwidth on IP networks. It supports tuning of various parameters related to timing, buffers and protocols (TCP, UDP, SCTP with IPv4 and IPv6). For each test it reports the bandwidth, loss, and other parameters. This is a new implementation that shares no code with the original iPerf and also is not backwards compatible. 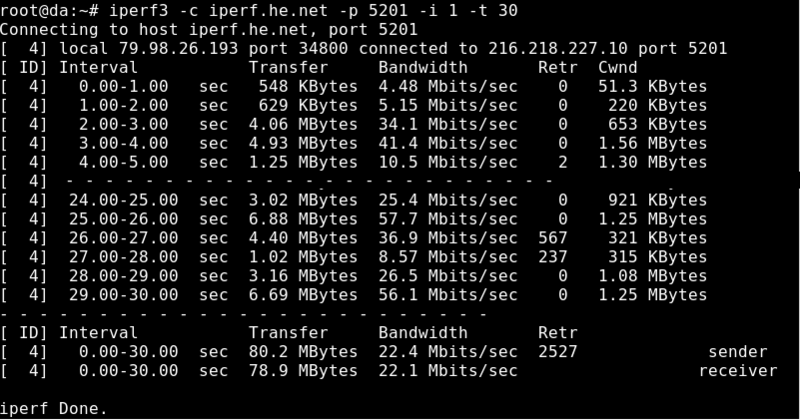 iPerf was orginally developed by NLANR/DAST. iPerf3 is principally developed by ESnet / Lawrence Berkeley National Laboratory. It is released under a three-clause BSD license. The tutorial was tested with our "CentOS 7" and "Ubuntu 16.04" templates and is meant to work on our self-managed virtual private servers. "CentOS/Debian/Ubuntu" operating system installed on server. Do not forget to change remotehost and port. That's quite interesting, you know. I'd like to recommend you this servise http://qatestlab.com/services/we-are-professionals-in/server-service-testing/ . If you'll have any problems with server part this guys would help you for sure.